For Greeks around the world March 25th 1821 symbolises the beginning of the revolutionary fight that ended 400 years of the Ottoman rule. Nicholas T. Pagonis, President of the Hellenic Community of Greater Montreal (HCGM) states that “as Greeks passionately wave the Greek flag and celebrate Greece’s National Independence Day, they proudly remember our ancestors who sacrificed so much and fought to maintain our identity, our values and our freedom. Needless to say, Greeks around the world salute and commemorate all those who have fought in a war”. The HCGM annual Greek Independence Day Parade will be held on Sunday, March 24th 2019 in the Parc-Extension borough. Dr. Apostolos Papageorgiou, Chief of Pediatrics and Neonatology at the Jewish General Hospital, this year’s Grand Marshall, will open the parade at 1:00p.m. More than an estimated 30,000 spectators will attend this unique annual event where Montrealers of Greek descent will patriotically wave their Canadian, Quebec and Greek flags and show their colours with great pride. The Parade will showcase approximately eighty groups, more than 3,000 participants, which includes all HCGM Schools and Departments, Greek associations, educational institutions, various cultural communities, a Canadian Armed Forces brigade, SPVM officers, just to name a few. Friday, March 22nd at 19:30: – Official Dinner at the “Salle Quebec” of the Hellenic Community Centre Adrian Maris 5757 Wilderton Avenue. During the dinner, the HCGM will present the “Hellene of the Year” distinction to a Greek nominee in recognition of their social contribution and their scientific and business successes. Saturday, March 23rd at 13:00: – Laying of the Wreath Ceremony in front of the Cenotaph of the City of Laval, 1 Place du Souvenir. Sunday, March 24th at 10:30: – Doxology at the Greek Orthodox Church Evangelismos tis Theotokou, 777 St-Roch, in the Parc-Extension borough. 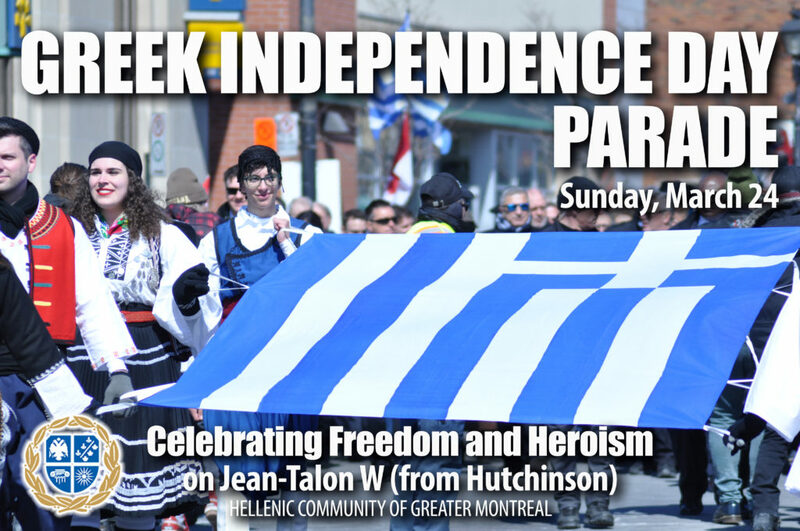 At 13:00 – Greek Independence Day Parade on Jean-Talon and Hutchinson. At 17:30 – Cocktail hosted by the HCGM in collaboration with the General Consulate of Greece in Montreal at the Hellenic Community Centre Adrian Maris 5757 Wilderton Avenue. Numerous philhellenes and officials from the Federal, Provincial and Municipal governments will attend the events.